Although the world knows the haunting theme to You Only Live Twice is performed by Nancy Sinatra in the movie, the production of the song took a few twists and turns along the way. Originally, producers sought one of the biggest stars of the day - British singer Julie Rogers. Best known for her hit "The Wedding", Rogers was married to Michael Black - Bond lyricist Don Black's older brother. She was approached to perform the song written by John Barry (music) and Leslie Bricusse (lyrics), and managed to secure an agreement with her own record label. Julie Rogers: "This came at the height of my recording career in 1967. I just had three number one hit records worldwide. I recorded the song at Universal Studios (near Notting Hill) with a 50-piece orchestra and John Barry. And to me, that was it, I'd done the theme." That was the end of her commitments to the production, but also the end of the road for the recording. John Barry: "It was usually the producers that said 'this isn't working, there's a certain something that it needed'. If that energy wasn't there, if that mysterioso kind of thing wasn't there, then it wasn't going to work for the movie." Roger's version of the song would go unheard for 25 years until it made an appearance on the American issued Bond 30th Anniversary double CD, incorrectly titled as a "demo" version by an unknown artist. Bricusse later confirmed that this was their first attempt at the title song, which although they eventually discarded, was not a demo. Rogers was identified as the singer and swift legal action was brought to EMI to correct the credit and royalties. Only two lines ("You only live twice", and "you’ll pay the price") were kept from the first version. The search was on for a replacement. According to a 2006 documentary by Channel 4, producer Cubby Broccoli had in mind one of the biggest names in showbiz - Sinatra, Frank Sinatra. John Barry: "Cubby Broccoli was a friend of Frank Sinatra's. So he phoned him up and said we'd love you to sing the song in the movie. But Frank said no, he didn't want to do it, but my daughter is really good! Have Nancy do it." Although Nancy Sinatra did indeed get the job, she was by no means second choice either. According to Bricusse, Barry had already lined up Aretha Franklin on the eve of her signing for Atlantic Records. However, the producers were insistent on using Nancy Sinatra who had just topped the charts with "These Boots Are Made For Walkin". 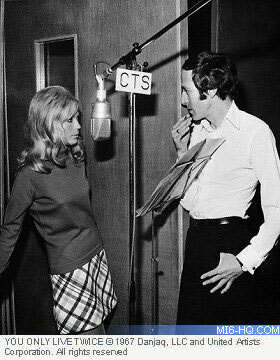 NANCY SINATRA AND JOHN BARRY AT THE CTS RECORDING STUDIO IN LONDON ON MAY 5TH 1967. IT WAS THE SECOND SONG NANCY HAD RECORDED IN ENGLAND. Marc Almond: "Nancy Sinatra was the epitome of that swinging sixties hipness, with her boots, her mini skirts, and her blonde hair. She was American as well, which I think was important because that gave the feeling that Bond was international. But there was also a sophistication to her as well." With Bond at the height of his popularity, performing the song was a daunting task for the 26-year old. Nancy Sinatra: "I was panic-stricken from the very beginning of the whole procedure. I would rather have root canal surgery than go through that again." The second version of the song, again by Barry and Bricusse, was a challenge for the singer. John Barry: "It was a long lyrical line which she wasn't used to singing at the time." Nancy Sinatra: "You Only Live Twice was difficult in a lot of ways. The fact that is was quite rangey, and I wasn't used to that, I was used to my little octave and a half. I even asked John, are you sure you want me to do this because maybe you need Shirley Bassey? But they said no, we want you, we want your sound." Despite a full day's recording, they didn't have one perfect performance. John Barry: "We took about maybe twelve takes and then when she had gone, we literally took pieces from all these takes that we had done and we stuck them all together and made the one tape that finally went out with the movie." "As we say, it was a hatchet job. But she loved it and when she heard it she called me up and said you made it sound wonderful." Nancy Sinatra: "There were bad notes, they just edited it together. They didn't want to embarrass me. I tried my best - I was 26 years old and really scared." All of this was hidden from moviegoers in 1967, except those involved in the production. Julie Rogers: "I saw the movie and sat there and cried. Anybody would! It was such a wonderful opportunity that just fizzled away for me."